If you are looking for a deeper understanding of how to effectively and efficiently manage your organization’s employee handbook, code of conduct, and policies and procedures, The Definitive Guide to Policy Management is your go-to resource. 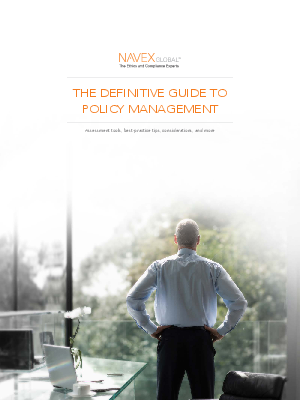 No matter where you are today in your understanding of policy management, or how effective your current system may be, this guide will close the gaps in your understanding and offer new and practical perspectives and insights. A definitive guide can be a lot to take in, so we have divided ours into three areas of study, each suited for a different user profile. Whether you wear one, two, or all three hats in your organization, these divisions will help you quickly access the information you seek.